* The fragrance starts with a burst of really fresh and ripe citrus – blood orange and tangerine. * Although it’s an Eau de Toilette, it reminds me of an Eau de Cologne with its focus on citrus. * The scent goes from a fresh start to a brief period of bitter citrus with a touch of musk. * Great for the summer as a refresher, the short life span ends on a sweet note with lightly candied orange. Summary: Honore’s Trip falls into the trap of many natural fragrances that lack longevity, as it barely lasts two hours on my skin. To me that makes it more of an eau de cologne or a splash rather than an eau de toilette. While it lasts it’s a nice citrus burst. If you’re a naturalist or have sensitive skin, this would be a good option for you. If you can handle non-organic chemicals, you can find more reasonably priced and longer lasting citrus fragrances out there. 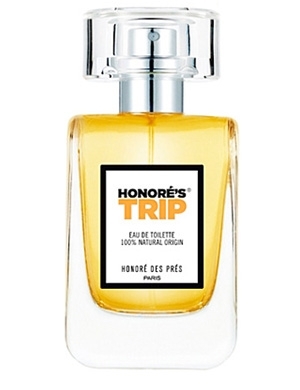 Honore Des Pres fragrances are available from online shops listed on the Honore Des Pres website.